To guarantee I use a legal image, he's a snap of my Halloween setup for 2008 =). Hope you all have a safe and happy Halloween! Here is the latest Restaurant.com discount code, only good through Halloween. Click here, choose your favorite restaurants, then when checking out enter the coupon code TREATS. This will take 80% off the cost of your gift certificates, which are usually already marked down by 50% ($25 gift certificates for $2). Usually the only restriction is that you spend $35 or more to use the $25 gift certificate. I don't know how restaurants can be profitable with these promotions, but at least they are attracting new customers. There are many local restaurants I never would have tried if it wasn't for these certificates. Restaurant Week continues with almost 50 different restaurants to choose from! All of them feature at least 3 course meals for $35 (appetizer, main course, and dessert). 28 restaurants are in San Jose, and many of those are either in Downtown San Jose or Santana Row. Silicon Valley Restaurant Week ends on Oct. 21st, so make plans now before it's too late! To see the full list of participating restaurants, click here. I'm a huge Halloween fan and have been going to most of the local Halloween events for the past several years. I thought I would share some of my top picks of places to visit. So far I have only been to the Halloween Haunt this year, but I have been to all of these in the past and they should all be quality events. The largest Halloween event in Northern California by a mile. Knott's Berry Farm was the first amusement park to throw special events for Halloween, and now that Great America is owned by the same parent company (Cedar Fair Parks) we get to share in the action. The second annual Halloween Haunt manages to surpass last year's impressive inaugural season. In addition to the park being entirely decorated for Halloween, there are a staggering 6 haunted mazes (one of which is brand new for 2009), a haunted ride (Logger's Run), and 4 Halloween shows (2 new ones for 2009). The icing on the cake is that almost all of the rides are still open and the roller coasters are being run with all the lights turned off. The cost is between $25-40 per person, making it both the most expensive local Halloween event and also the one with the greatest bang for your buck. The preeminent Bay Area Halloween event for almost 2 decades is returning this year with a good dose of new content. There are 6 different attractions, at least 2 of which are haunted mazes. These guys really know how scare that pants off of you, so be prepared for a more intense experience than some of the other Halloween events. The cost is $20 per person. Stalking Raging Waters this year is a San Jose staple, Gyro's! This year they have 3 haunted mazes, a DJ station, 3D games, and several other attractions. In case you're wondering... smell is the 4th dimension. This one will also set you back $20 per person. Several Downtown businesses are offering special discounts and improving customer service to help weather the recession. The Hotel Montgomery will be converted into a Four Points Sheraton, which will make it the first Starwood Hotel in San Jose (this chain includes Sheraton, Westin, W Hotels, St. Regis, etc.). San Jose Museum of Art will celebrate its 40th anniversary on Oct. 17th, and now attracts over 200,000 visitors each year. The Tech is getting a new Star Trek themed exhibit which opens on Oct. 23rd. They have also opened a "Hall of Fame" exhibit. San Pedro Square now features 515 new LED bulbs, making them much less likely to burn out and 10 times more energy efficient. The San Pedro Farmer's Market is open for business every Friday from 10am-2pm on San Pedro between Santa Clara and St. John streets. Downtown parking validation will soon be simplified. Instead of using 20min stickers, you will receive either a 1hr or 2hr magnetic ticket that will be accepted at all of the automated parking payment machines. There will also be a 3.5hr ticket for Camera 12 validations. More airport food is becoming available at the new SJC airport terminal. The Brit, Le Boulanger, and Sora's Japanese are now open. Sonoma Chicken Coup and Schurra's Candies are coming soon. Silicon Valley Restaurant Week is going to be from Oct. 14-21. Downtown San Jose restaurants represent one fourth of the participants. More info at http://www.siliconvalleyrestaurantweek.com. An Irish Innovation Center is coming to 177 W. Santa Clara near San Pedro Square and will house up to 35 Irish companies hoping to establish a US presence. There are so many Restaurant.com promotions that I am only going to mention them if the discount is 80% or higher. Click here to take advantage of the latest discounted restaurant gift certificates for Silicon Valley restaurants, then when checking out enter the coupon code FOUR. This will take 80% off the cost of your gift certificates, which are usually already marked down by 50%. This translates to a $25 restaurant gift certificates for a measly $2. I think I've used a dozen of these already and had never ran into any major issues (Fuel didn't accept a CC payment if you use a certificate, had to be cash). I can't believe how low IMAX prices have gone at The Tech recently. 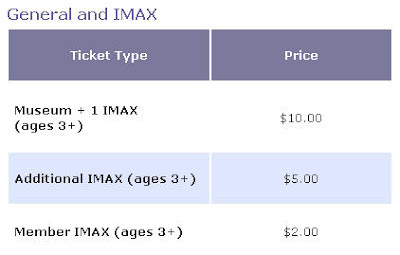 Anyone remember when it used to cost $14 to go see an IMAX movie and about as much to go see the exhibits at the museum? Today, you can go see an IMAX movie at the dome AND gain access to the museum for $10. If you purchase a $25 annual membership, then IMAX movies become equivalent to a bellhop tip at $2 a pop. I think I'm going to have to look at the upcoming roster of IMAX movies more carefully from now on.